What if Thor was a Blaxploitation character in the mid-70’s? My brain asks these questions some times. Oftentimes, they turn into stories. 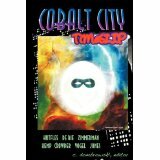 In this case, I was contemplating the Cobalt City Timeslip anthology Timid Pirate Publishing was putting together. We had stories ranging from the early pre-history of the area up to modern, but no one had tackled the Silver Age. Or, as I like to think of it, the period of Weird Heroes. This was the era where you got a lot of strange comic books, including favorite characters like Ragman, Howard the Duck, Man-Thing, Daimon Hellstrom the Son of Satan, Brother Voodoo, or Satana, Ghost Rider, and of course Dracula from Tomb of Dracula. You were starting to see superhero books that flirted with the mystical and certainly the weird. You were also seeing a decade of new, prominent black characters–you could tell because most of them had “Black” in the name: Black Lightning, Black Panther, Black Goliath, and then Power Man, and the Falcon (debuting in 1969 as the first character of African descent not to have “Black” in his name). The mid-seventies in comics was just way too cool for someone to pass up. So I started thinking about what was going on in the mid-seventies that excited me. Part of it was that whole post-Age of Aquarius vibe of magic and the old gods returning. Toss in movies like Shaft and Superfly. Then there was the music! Soul was starting to give way to disco. These were chaotic times. The mid-seventies were tumultuous. Watergate was still fresh on the mind, as was the specter of the Vietnam War. That was some very fertile ground in which to plant seeds. So I thought about one of the most iconic god-heroes of comic books–the golden haired, hammer-swinging God of Thunder. I mean, he’s public domain. No one owns the Nordic gods. And in fact, the more you distance your vision of Thor from an established interpretation, the more freedom you get. So what if Thor wasn’t a person so much as a title–an Avatar or the concept of the God of Thunder? What if Thor was like a Voodun Loa, a powerful spirit that rode a mortal host, a horse/mount as it were? Well then…Thor could really be anyone then, couldn’t he? For instance, the mantle of Thor could be passed from one person to another on the field of battle, from a dreamy eyed Norwegian-American soldier to his platoon-mate, a hardened African-American from a poor neighborhood of Cobalt City. He’s not really Thor. He’s just the current embodiment of Thor. This is how Cole Washington was born–an amalgam of influences culminating in my story “The War at Home” which is now available to read for free on Timid Pirate’s site. But here’s where the story gets interesting. It seems my friend and fellow author Minerva Zimmerman is a HUGE fan of Nordic mythology. And my story sparked all kinds of ideas in her brilliantly twisted mind. The end result of that is her novella “The Place Between,” in which Cole’s daughter begins to navigate her own destiny and her own relationship with the God of Thunder. Rich with humor, humanity, a clear love of Nordic mythology, and a hearty dose of action, this is the Thor for the NEXT generation. It’s currently available in Cobalt City Double Features, either directly from Timid Pirate in a 3-format bundle, or straight to your Kindle from Amazon. It will be available from the Barnes & Noble site soon directly to your Nook. It even includes a smashing new Erik Scott de Bie novella featuring Stardust and Lady Vengeance which is not to be missed. It’s a good summer to be a superhero fan! Mythology has been, and will continue to be, a great source of “public domain” inspiration for comic book creators. The characters that you’ve listed ( Ragman, Howard the Duck, Man-Thing, Daimon Hellstrom the Son of Satan, Brother Voodoo, or Satana, Ghost Rider,, etc…) would be considered Bronze Age characters. Not Silver as you’ve stated. The Bronze Age of comics is generally accepted as being the publishing period between 1970 to 1985. (Give or take a year). Those are the comics I grew up reading, and still enjoy revisiting. I don’t know HOW I forgot about the Bronze Age. Thanks for the reminder! That was a magical period of comic books for me, back when I was young enough to accept that just about any kind of story or character was possible.